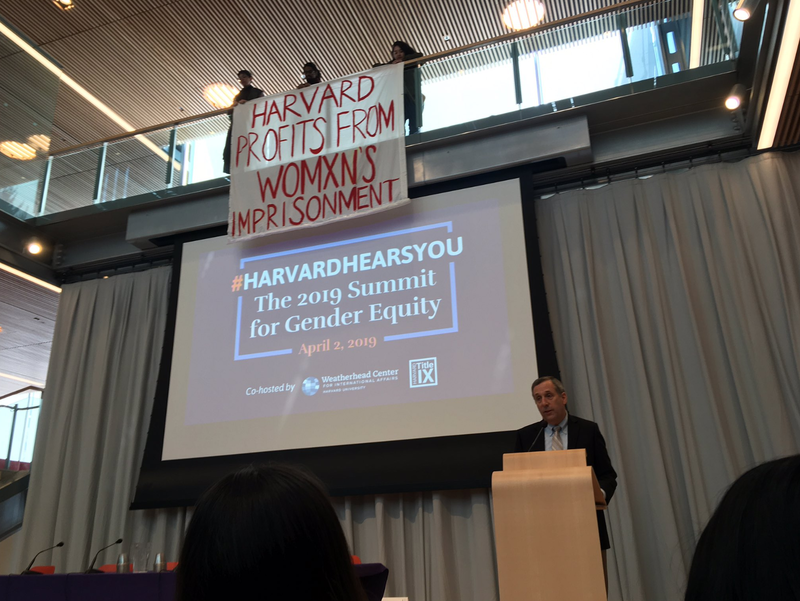 The students of HPDC dropped a banner during Harvard President Lawrence Bacow’s speech at the Gender Equity Summit in the Smith Center in Cambridge, MA. In large crimson letters, their banner read, “Harvard Profits from Womxn’s Imprisonment.” Other HPDC students held up signs in the crowd that stated, “Harvard Invests in Imprisoning Women” and “Harvard, Divest from Imprisoning Trans People.” And still other HPDC students distributed information on the intersection of gender inequity and mass incarceration. Bacow did not comment on the banner, continuing his policy to not “politicize” the endowment and to ignore HPDC’s demands. Bacow told HPDC students in mid-February that he could not “policitize” the endowment and that he had too many divestment requests to respond to them all. “It is disgraceful and, frankly, dishonest of Bacow to host a summit that attempts to celebrate Harvard’s role in gender equity, while he maintains an endowment that financially endorses prisons that cage, abuse, and systematically repress women,” said Megan Lee, a student at Harvard Divinity School. The students delivered a petition to President Bacow on March 1 with over 3,400 signatures and their campaign demands. Their demands include (1) the public disclosure and release of endowment holdings in all funds with stock in companies whose existence depends on the prison-industrial complex, and (2) the apportion of a significant percentage of divested funds toward companies, organizations, and initiatives in Cambridge and Boston that are led by people directly impacted by the prison-industrial complex.